If you love roasting winter squash like Butternut, Delicata, etc but dread peeling and cutting it (or fear losing a finger), I just learned a great tip today that I thought was worth sharing. Pierce the skin of the squash with a fork or knife all over. Microwave the squash anywhere from 2 to 4 minutes, or longer if needed depending on the size. Let it cool, them start peeling and cutting! The microwave softens and loosens the skin, making it fall off more easily. Any advice on softening the skin in an oven , particularly a Breville convection toaster oven). I love the sound of this recipe but don’t, have a microwave! I’ve been staring at a small butternut squash for a while now and any advice I’ve seen is always microwave based! I made this tonight in my Instant Pot. It was so good and flavorful! My grandsons ( 7 and 8) asked for more. We all gobbled it up. Will make again. Worth the effort. ? Can you freeze delicata squash if you cut in half and remove seeds? Not sure, I haven’t tried. A peeler with a ceramic blade makes peeling butternut squash much easier!!! I will definitely use the microwave to make the cutting the squash easier (and save fingers!!). Great tip, definitely going to try this! The last time I tried cutting a raw squash (3 years ago), I ended up with 5 stitches in my thumb. Since then, I either roast whole or buy the pre-cut! OMG. THANK YOU. I had hand surgery a month ago and any peeling is rough let alone giant squash like kabocha! Life saver! Delicata is the one squash that you DON'T have to peel before eating. The skin becomes soft and delightful during the roasting process. I can't recommend this for any other squash. Holy cow….using these instructions cut the cutting/peeling time in half! I love using pumpkin and butternut squashes in the fall, so thanks for sharing this tip! Any suggestions for acorn squash? The ridges are killer! An additional tip from my husband….use an ice cream scoop to easily remove the seeds and stringy stuff from the middle. Works great for pumpkins, too! Also, I use a cleaver for making the initial cuts. 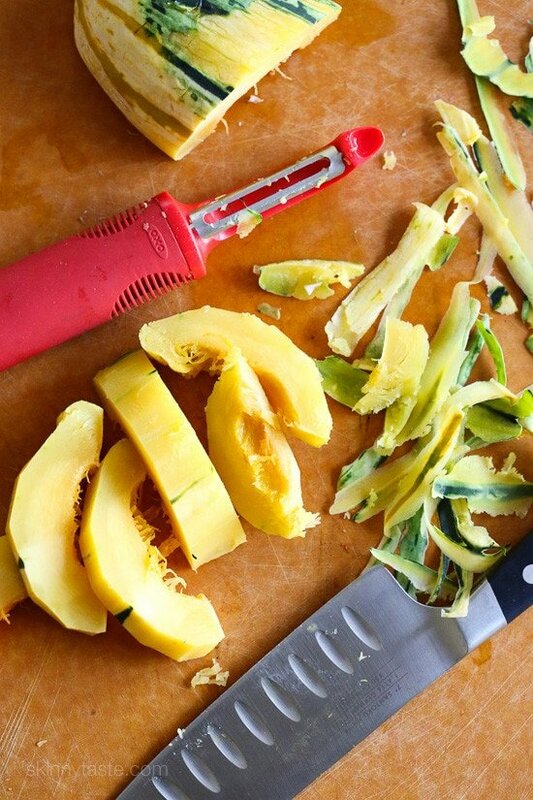 The large, heavy blade goes through the squash easier than a chef's knife. Love the ice cream scoop idea. My spoons have smooth edges and make it difficult to scrape out the seeds. My husband used the Flavor Bible a few years ago with some Delicate Squash and came up with a wonderful recipe. Cut in 1/2. Roast in the oven skin down with salt, pepper and nutmeg to taste for 20-25 minutes at 400-425. Roast the seeds as well. Then top with lime juice and cilantro and the roasted seeds. Eat the flesh and skin. Very tasty! I leave the skin on the delicata as it is so good! I peeled and cut a butternut squash the other day, and got this weird residue that stuck to my hands all night – I googled it and sure enough it's a thing! So weird, I'll just roast in half or buy the pre-diced next time! I have also put the whole butternut squash into a 350 oven for 10', let cool-skin peels off easy as a cucumber. I wish I had know this last Sunday when I cut so much squash I ended up with 2 small blisters from chopping so much! I can't wait to use this next time! Great post – thank you! I do something similar with Spaghetti squash….. after a bit soft, cut in half and continue in the microwave…… then cook and/or season….. I sure wish I'd known this sooner. I could have saved so much time over the years. Oh well, now I know! I recently saw a tip somewhere about microwaving a butternut squash for about 2 min (punch a hole or two) ; cool and you're able to peel more easily. I tried it and it works! No more buying pricey diced butternut squash anymore!!! I like to cook them in a crock pot. I put a piece of aluminum foil on the bottom to keep it clean and cook on high for 4 hours, cut it in half and then scoop out the seeds. No need to pierce or anything. Sweet potatoes are also wonderful this way. Baked potatoes take less time. Thank you, love this idea. Had a delicate on Sunday and it was tough cutting and peeling. I don't have a microwave anymore so I just have to do it the old way. However with Delicata squash you don't need to peel it as the skin is edible; It is a delicious little squash & very easy to prepare. Can't wait to try this….I too have a history of almost losing a finger due to a knife slipping when I tried to cut my spaghetti squash in half. I have the produce man cut and wrap it for me now — free of charge. Much easier! Thank you for this tip, it with help me fir the next time. the skin is perfectly edible- just scrub well prior to preparing. I just roast it with the skin on, then scoop out the flesh after it's cooled. So much easier! As has been stated, it isn't necessary to peel delicata. Due to the thinner skin, it will soften during cooking and is perfectly edible. I just made Delicata last night and forgot how hard it was to cut, esp with arthritis in my hands. I needed a hatchet! Thank you so much for this tip! Skinning butternut squash has always been a huge pain for me. I've had a similar tip for swede (not sure what you call it in the USA I'm in UK) to make easy swede mash put swede in microwave on full power for 15 to 25 mins. Do not peel or Pierce it at all beforehand put it in whole. It 'sings' as it cooks. When done cut the top off and scoop out your lovely hot mashed swede. I got a serrated peeler a few years ago, it cuts through squash flesh with ease! I can peel and cut an entire butternut squash in about 5 minutes flat. I used to sell Pampered Chef products. Their peelers are awesome! This is a great tip. If I am going to be mashing or blitzing the squash, I buy it already cooked and mashed in the freezer section. It is CHEAP and saves me so much time. 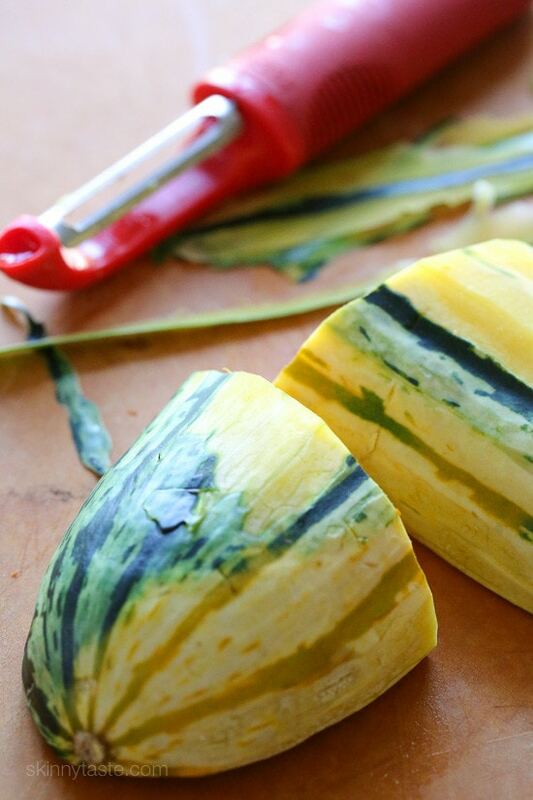 You don't have to peel delicata squash, it's 'delicate' skin is edible! I never peel that one and that's why it's my favorite squash! It's also really really tasty. P.S. Peeling butternut squash always gives me contact dermatitis so I have to wear gloves. So tasty but such a pain to prep! Another plus for delicata! This works with any squash, I also did this today with butternut and it worked like a charm! This is exactly why I love delicata squash. Well, one reason. No reason to peel at all. I roast them with the skin on?? the only way I'd ever think to cook them. the thought of peeling them never entered my mind. I do, too, but this is a fantastic idea! There are tons of wonderful recipes that start out with peeled, sliced or chunked squash. Squash bread pudding and squash and potato gratin are two. If you' et never had to peel a squash for a recipe, you're missing out on a lot of good stuff! Thanks for the tip, Gina. You just saved me a lot of time! Thank you so much. I have been splurging for the pre-diced in my produce section but this will save so much money! Thank you, Thank you….I really appreciate this post!